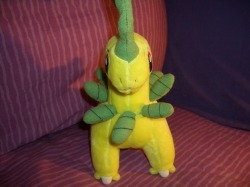 One of my top favorite plush. I love this guy! 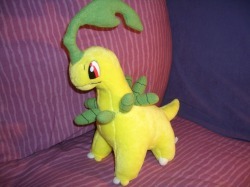 You see, many years ago when I visited the Pokemon Center as a tween, I saw this Bayleef plush and instantly wanted it. However, whenever my sister and I went there we always bought mountains of TOMY figures, so I felt bad asking my parents for the plush too. I decided I would get him "next time" ... but of course it was never in stock again. I had been searching for it ever since I found pkmncollectors, and amazingly this summer I stumbled across an auction for one on eBay! I got incredibly lucky, had zero competition and ended up getting it for $17 shipped! For reference, one that this month on eBay went for $75.50 shipped (same condition as mine, no box just tush tag) XD. My Bayleef is in fantastic condition, and I couldn't be happier with it! He's almost 10 years old too, as tush tag says its from 2001. 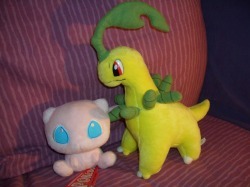 The last picture is a size comparison shot with my Mew Pokedoll. 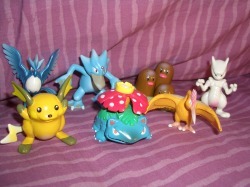 The TOMY form of my very first Pokemon team. I used to rotate between these 7. Raichu with Thundershock, Thunderbolt, Thunder, and Thunder Wave? OH YES.